Multiple characteristics will be evaluated simultaneously to show clinically relevant heterogeneity in treatment benefit between patients. Multivariable prediction modelling substantially increases statistical power compared with other approaches and is more robust, especially in small data sets. We will use a relatively small cohort for the development of a prediction model. Using a proportional odds model requires the assumption that the ORs are the same for each cut-off of the modified Rankin Scale. RCTs provide estimates of treatment effects for average patients. However, it is important to take potential heterogeneity of treatment effects into account. Clinically relevant differences in the absolute effect of a treatment can be caused by (1) differences in the relative treatment effect (predictive effects) and (2) differences in baseline risk on the outcome of interest (prognostic effects).10 ,11 For example, in the Multicenter Randomized Clinical Trial of Endovascular Treatment for Acute Ischemic Stroke in the Netherlands (MR CLEAN) trial, there is no predictive effect of age; the relative treatment effect is constant across age subgroups.1 This is demonstrated by a non-significant test for interaction between age and treatment (figure 1A). However, variation in baseline risk on favourable outcome according to age results in a larger absolute treatment benefit in younger patients (figure 1B). 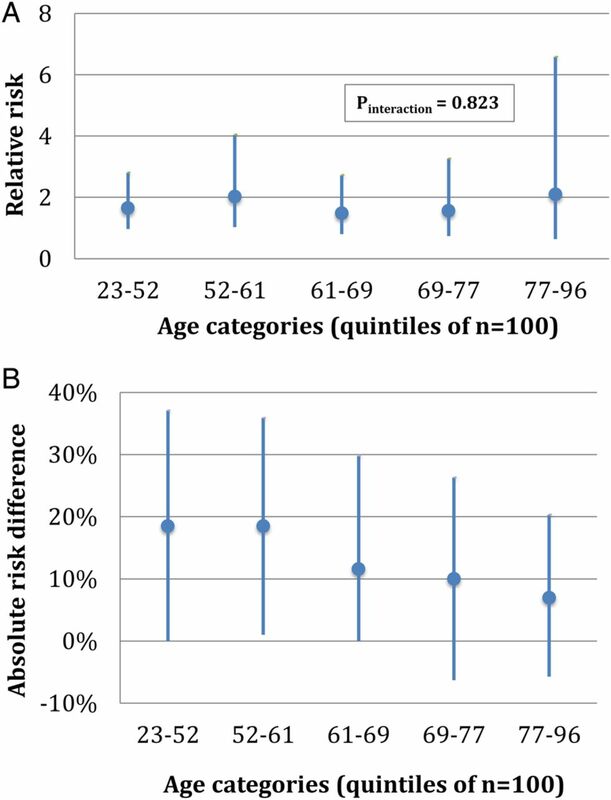 Relative risk (A) and absolute risk difference (B) for good functional outcome (mRS 0–2) in MR CLEAN sort by age. MR CLEAN, Multicenter Randomized Clinical Trial of Endovascular Treatment for Acute Ischemic Stroke in the Netherlands; mRS, modified Rankin Scale. Conventional subgroup analyses are focused mainly on predictive effects and assess the effect of only one variable at a time. If predictive and prognostic effects of multiple characteristics are evaluated simultaneously in multivariable prediction modelling, it is likely that larger heterogeneity in treatment benefit between individual patients will be found. Our aim is to improve selection of patients for IAT by predicting treatment benefit or harm for individual patients with stroke. The primary outcome will be the modified Rankin Scale (mRS), a seven-point scale ranging from 0 (no symptoms) to 6 (death) at 90 days after stroke.13 We will provide estimates of treatment benefit as the absolute increase in probability on functional independence (defined as mRS 0–2) and survival (defined as mRS 0–5). Timing of treatment is an essential predictor of outcome. Since time to randomisation was not a reliable indicator for time to treatment in the MR CLEAN trial and will not be applicable in clinical practice, we will use time from stroke onset to groin puncture. Since time to groin puncture is not observable in the control group, we will explore imputation approaches based on the correlation with time to randomisation. All other baseline variable values are more than 98% complete in the MR CLEAN data, so we choose simple imputation by the mean for continuous variables and simple imputation by the mode for categorical variables. Model performance will be expressed in discrimination and calibration. Discrimination will be quantified with the c-statistic. The c-statistic is similar to the area under the curve for binary outcomes and estimates the probability that out of two randomly chosen patients, the patient with the higher predicted probability of a good outcome will indeed have a better outcome. Calibration refers to the agreement between predicted and observed risks and will be assessed graphically with validation plots, and expressed as calibration slope and an intercept. The calibration slope describes the relative overall effect of the variables in the validation sample, and is ideally equal to 1. The intercept indicates whether predictions are systematically too high or too low, and should ideally be 0.32 We will calculate a general c-statistic to express the performance of our ordinal model and additional calibration plots with specific c-statistics for the predictions of favourable functional outcome (mRS 0–2) and survival (mRS 0–5). The c-statistic will be internally validated with a bootstrap procedure (500 samples with replacement) to estimate the degree of optimism in parameter estimates.8 After penalisation of the regression coefficients, we will externally validate the model on data of patients in the Interventional Management of Stroke III trial (IMS III) with an occlusion in the anterior circulation on non-invasive vessel imaging.33 Coefficients of the final model will be fitted on the combined development and validation data sets. After validation, we will assess whether the model can be used to discriminate between patients with low and high expected benefit by making individual predictions of outcome for all patients included in the development and validation data. The final model will be digitally available for use in clinical practice, both for mobile devices and as a web application. It will provide predictions of all mRS categories for each individual patient, both with and without IAT. Findings will be disseminated widely through peer-reviewed publications, conference presentations and in an online web application tool. Formal ethical approval was not required for this study as primary data were already collected. Furthermore, even though the MR CLEAN trial has included most patients of the recent RCTs, the cohort remains relatively small for the development of a prediction model, especially for the selection of the main effect and interaction effects. We will reduce regression coefficients to prevent overfitting and also perform external validation. In the future, we will further validate and update our model in the pooled individual patient data of the Highly Effective Reperfusion evaluated in Multiple Endovascular Stroke Trials (HERMES) collaboration, harbouring data of all patients from recent randomised trials regarding IAT (over 1700 patients in total). Moreover, we aim to investigate the validity of our model predicting outcome after treatment in clinical practice. Our model will therefore be tested by applying it to recently treated patients in all Dutch neurovascular centres participating in the MR CLEAN Registry (mrclean-trial.org). We will use a proportional odds model to analyse the full mRS score as outcome. Formally, this model requires the assumption that the ORs are the same for each cut-off of the mRS. However, previous studies have shown that even if the proportionality assumption is violated, proportional odds analysis is still more efficient than dichotomisation.39 In addition, all recent RCTs on the effect of IAT used the full mRS and analysed their results with proportional odds regression. The proposed study will provide an internationally applicable clinical decision aid for the selection of patients for IAT. We consider this study an important next step towards personalised treatment of patients with AIS.
. Clinical prediction models: a practical approach to development, validation, and updating. New York: Springer, 2009.
. Treating individuals: from randomised trials to presonalised medicine. London: Elsevier, 2007.
. Regression modeling strategies: with applications to linear models, logistic regression, and survival analysis. New York: Springer-Verlag, 2001.